I have been getting some sewing done this week for Kids Clothes Week, but I don't have anything to show you yet. 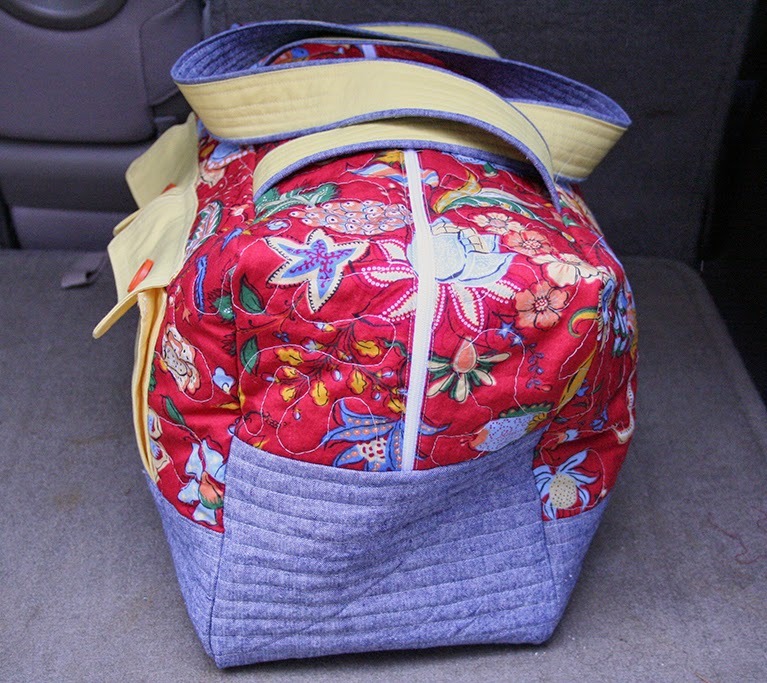 So, instead, I am sharing a duffel bag that I made for my mother-in-law's birthday a few weeks ago. 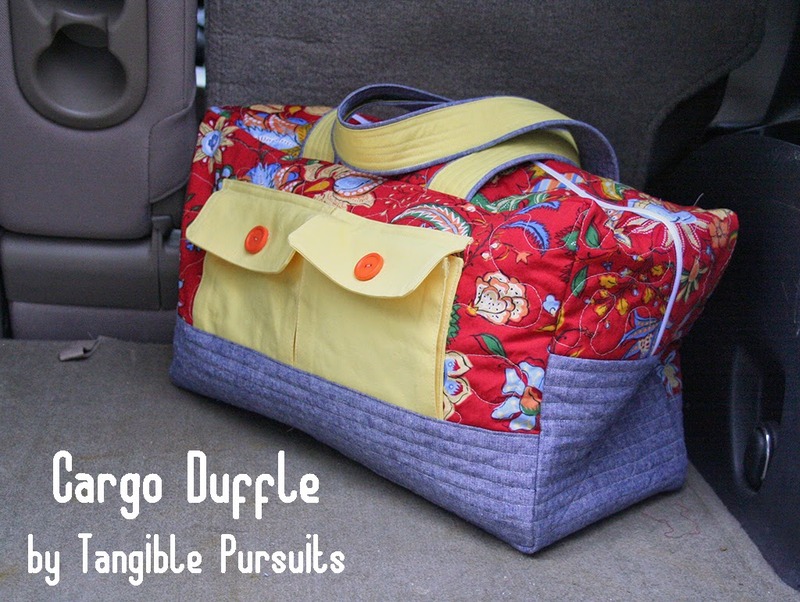 I used the free Cargo Duffle pattern by Anna at noodlehead. The main change I made was to widen the sides. As it was, the bag looked a little narrow to me and I wanted it to be a good size for a carry on or overnight bag. I made the sides 9" wide instead of the 6.5" called for in the pattern. The floral fabric I got on Listia, a kind of bartering site that actually has a good group of people listing sewing and crafting items. The bottom panel is a yarn-dyed linen blend in denim blue that I got from Fabric.com. The yellow is Kona Cotton Lemon, also from Fabric.com. I used a 7oz duck canvas in cream for the inside. 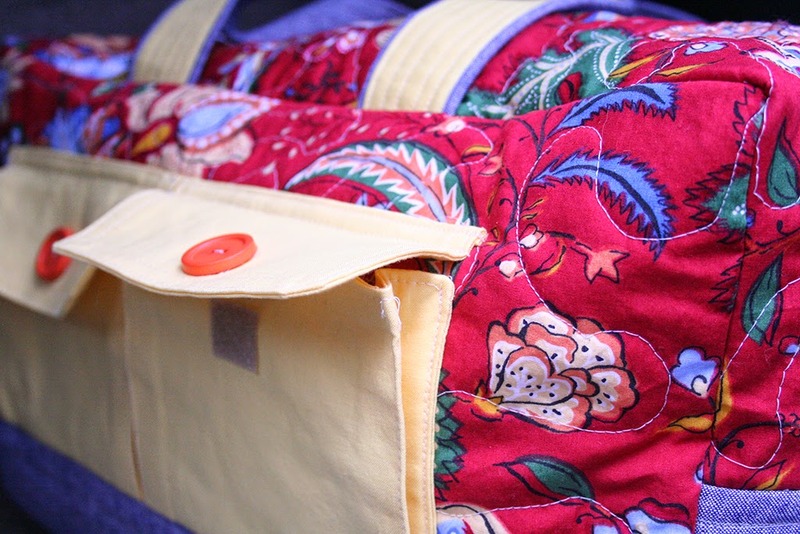 I did straight line quilting on the bottom pieces of the bag, just as Anna had done in her original bags, but for the top I did a meandering quilting design. I thought that went better with the floral fabric, and it was also a lot faster. For the pockets I used velcro instead of snaps and added a decorative button on the outside. For the inside, I just bound the seams as the pattern called for. 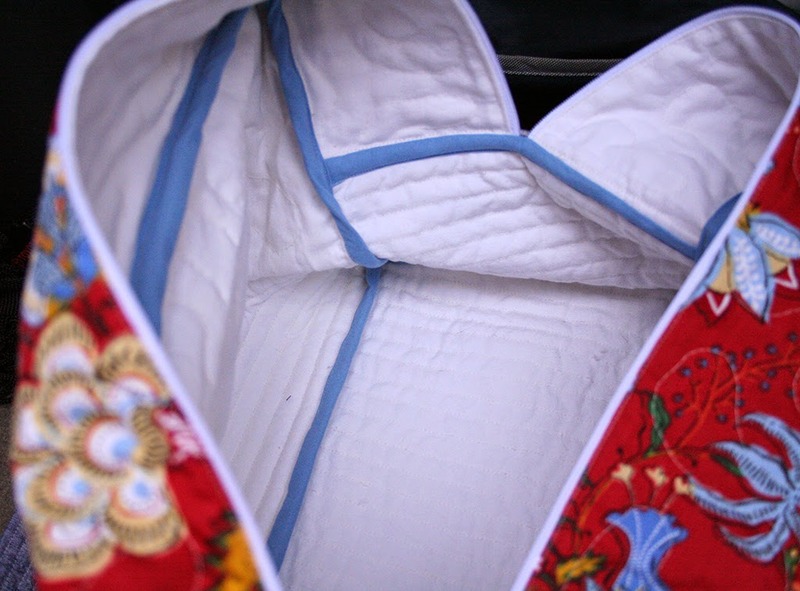 I know some people have added linings to their duffel bags, but I didn't think that was necessary, and I must say, this bag did take a while to sew as it was - I didn't have time or fabric to add a lining. I am really happy with how this bag came out. It was a bit of work but it was worth it. I think it looks really polished and hopefully will be something my mother-in-law can get a lot of use out of! What a fantastic bag! I love it! It looks like a Vera Bradley bag - actually I thought it WAS one until I clicked over! It looks amazing! can't wait to make one of these bags! beautiful!